I’m writing this post hoping that the words will flow naturally across the computer screen. I don’t know if it’s my long absences from the blog that have me experiencing the worst writer’s block of my life, or if it’s my subconscious saying that my Inspiration API has reached it’s max (an allusion to my constant overuse of my twitter API, for those of you who didn’t know what I was speaking of). Whether or not my writing inspiration has reached its limit, my other inspirations in life have not. My photography inspirations constantly make me want to try new things with my new camera, and heck, I can now say that I actually know how to use Adobe Lightroom to edit my photos! 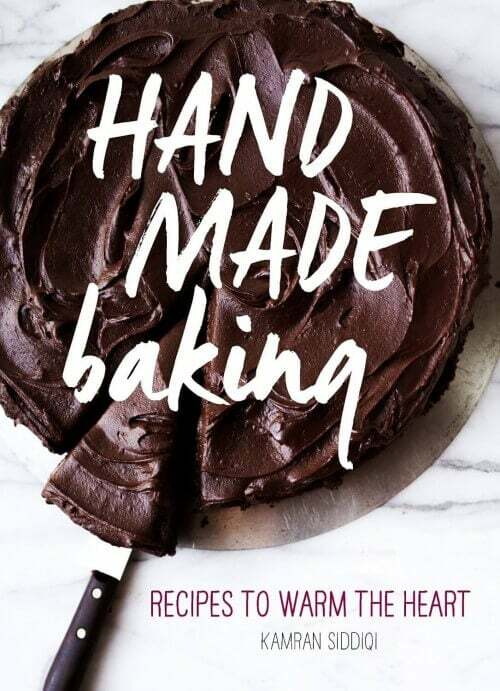 As for recipe inspiration, let’s just say that I’m up to my head in inspiration in that category- I just wish there were enough hours in the day, enough counter space, enough mixing bowls, and enough ingredients to make everything happen, but life isn’t perfect. There’s only twenty-four hours in a day, two countertops in our considerably tiny kitchen, one small sink to wash all of the dirty mixing bowls and dishes in, and one person doing all of the work- me. Wouldn’t it be great to have a recipe so simple that you only dirty… Oh… five things or less? Well, I’ve got just the recipe for you! You can forget getting your hands all prune-y looking after washing a sink full of dishes. Forget the hot water beating on your hands, while you’re sweating up a storm in your already warm kitchen (thanks to the eighty-something degree weather we’ve been experiencing here in the tri-state area)! This recipe is so simple, that it’s kind of a joke for me to include on the blog, but it’s still a recipe. 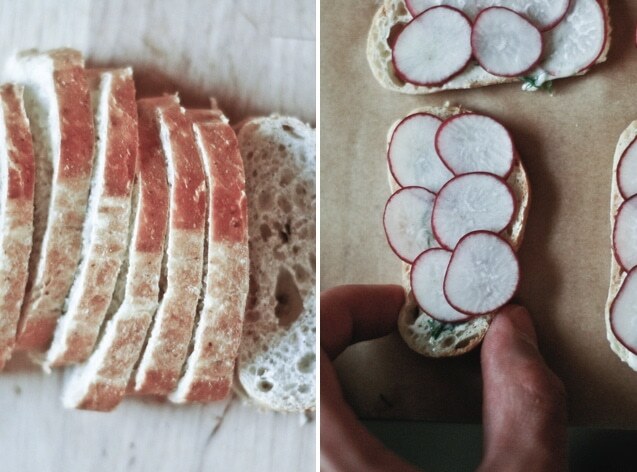 A refreshing recipe at that- radish-dill tea sandwiches. The freshness of the dill in this recipe works very well with the mild peppery, crisp flavor of the beautiful ruby red radishes. After taking a bite out of one of these small tea sandwiches, you’ll be making these small open face tea sandwiches time and time again, trust me on that! Mix room temperature butter and dill in a small mixing bowl. Season with salt, to taste. Spread butter mixture onto slices of bread. Top with thinly sliced radishes, overlapping them slightly. Sprinkle with sea salt, if desired. The photos are definitely gorgeous !! Your photos are amazing. Sometimes simple recipes are the best! You have such a way with words. I must be so spoiled with three sisters to help with prep and cleanup. Hats off to you! Your sandwiches sound delicious and refreshing. And your photos are lovely. Nice photos! I like the addition of dill. I love the cooking and the eating, but always have to gird myself for the cleaning! Still, its often well-worth the labor. My sister loves radish sandwiches and I’ve been eyeing the bunches at our farmers’ market – now I have good reason to pick them up! And your photos are simply lovely! I think the pictures are very old-world. With the idea of more light in food stylin/photography, this comes as a fresh gust of air. I love the gauzy/airy look of these photos, you must have done a good job editing! Simple is the best, and your photographs are charming K!! Loved the read! Beautiful photos! I adore tea sandwiches and yours look amazing. So simple, yet so delicious! Sometimes, we really need simple. This is a good time for that :). The summer is almost here, so you can switch to whichever mode you like and write whenever you are inspired to do so. Exams can burn us out, but summer is meant for regeneration :). 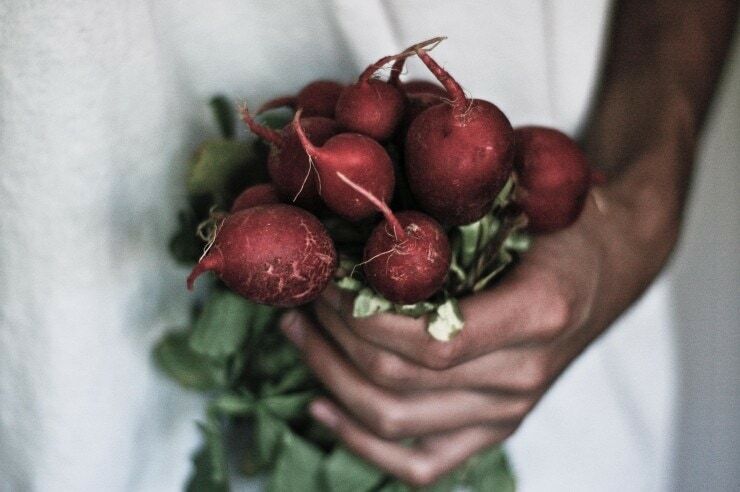 The bouquet of radishes in your hand is the most gorgeous, inspiring photo. I’m drooling over a dish I’ve always taken for granted. Less is always more with you Kamran. I do so love your artful photos and interesting color pallet. Well, you’ve just proven that less really is more! Super idea. 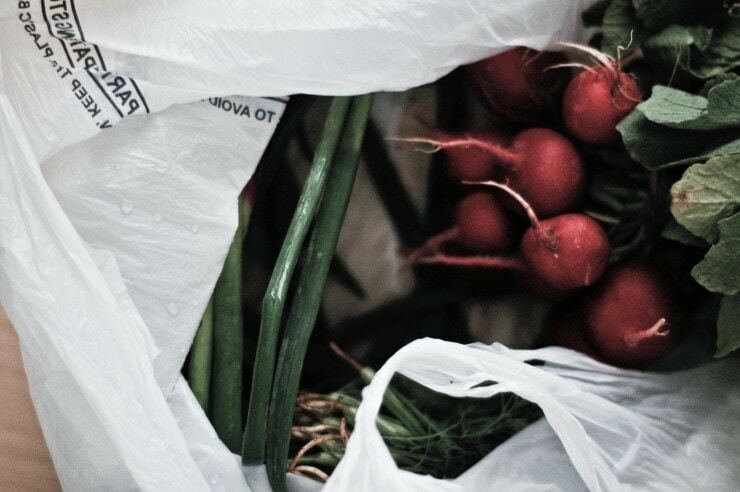 Photos like that make we want to RUN off to the farmers market! Thanks for sharing. Lovely pictures! Now I’m hungry, too. Can’t wait to get some radishes from our CSA. I love simple recipes and tastes. they are usually the best. I love tea sandwiches and they look magnificent. Looks like you and the new camera have meshed! I have been thinking about tea sandwiches, cucumber, egg, sprouts, etc. Must get busy and make some, great for summer. These are perfect springtime, little tasty sandwiches. No recipe is ever too simple – I’m glad you posted this and obviously others are too because you made Top 9 – congrats! It reminds me of when I went to live in France and was served radishes with butter and salt as a starter – what a revelation. I never thought to parlay that into a sandwich – great idea! Mm, my grandma always used to grow radishes in her little garden in the backyard. Your post wakes up good memories! Congrats on the Top 9!!! :)Love the tea sandwiches!! Radishes have always scared me I still don’t know why but I think now they won’t. i just harvested our first radish of the season yesterday. wonderful timing. i am looking forward to trying this recipe. beautiful photography by the way! 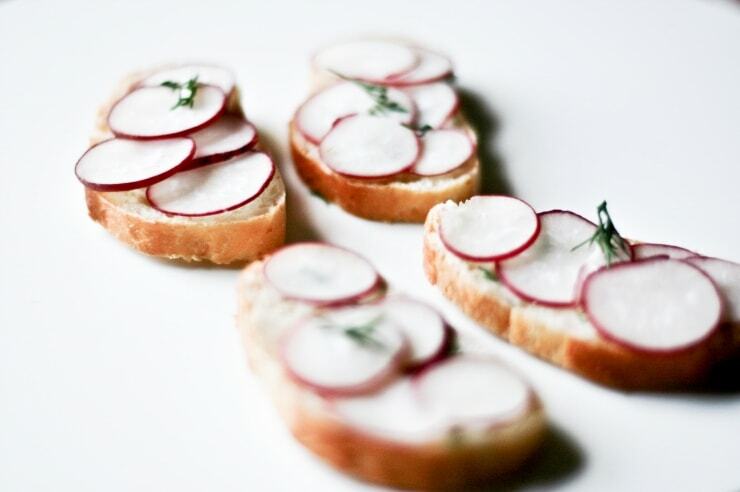 radish and butter on a baguette is one of my favorite springtime treats! so simple, so good. Wow, this is sort of a coincidence: I have plans to make an array of tea sandwiches this weekend for a bridal shower, and here you post this recipe! I was originally planning to make my vegetarian sandwiches with cucumber, but I think I will also include some of your variety. :) Just LOVE your blog, I really cannot wait to see more of your posts. I am definitely looking forward to more from you! 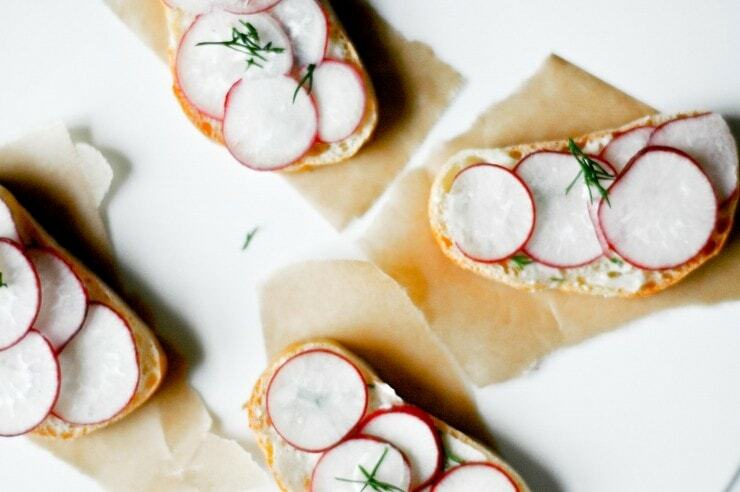 Never too simple, I love radishes and they really are very good all on their own but why not make an open face sandwich with a few nice additions? It makes for good reading even out of the tri-state area! The first thing I thought when I clicked through from my Reader is THIS KID NEEDS A BOOK. Seriously, Kamran, your photos are insanely gorgeous. I am so impressed. These look so elegant! I absolutely love tea sandwiches and these would make a lovely addition to the High Tea I plan to be making soon. Thanks for the inspiration and lovely pictures! Here’s hoping you are officially unblocked as a writer. I so agree that simple is best, you can taste the flavors rather than have too many fighting each other. so less is more. http://www.sophisticatedgourmet.com‘s done it again! Superb article. I love the simplicity of your food styling and photography. Nothing messy, just beautiful pictures. And sometimes one just needs something really really simple like these sandwiches. You’ve done it once more! Incredible read. The sandwiches look lovely. Yes, that still counts as a recipe! I’ve enjoyed hosting tea parties for my grandma with my mom, and now I have a new recipe to add to the inspiration. Thanks! Photography-amazing, Food-delish! Writing-snappy! Loving it. Well, all I have to say (except that I love tea sandwiches) is: I don’t think your inspiration API has reached it’s maximum, man! It’s always great reading you and looking at your beautiful pics! Wonderful article! Cooking for me is a passion and I’m happy to have read about the article. Cooking is an art as well as a talent. It takes an ample dose of dedication to come up with a tasteful dish. It’s interesting how well they prepare the food that looks oh so delectable! Subscribe to our mailing list and get recipes and weekly email exclusives sent to your inbox.